Theresa's Crafty Creations: Holy Shiitake!! Super cute! I don't have any gnomes. Maybe I need to get a stamp set since they always seem fun. Cute card!! Love the little gnome!! Too cute Theresa Love the little Gnome and you colored him perfectly. Fin papers and shapes really go with the whimsical card. Love the sentiment. Adorable birthday card! The little gnome is colored so prettily and I love the awesome shapes in your background! Super cute card Theresa! The gnome is so cute and I love the sentiment! Such an adorable card! I love the fun dies and papers you used! 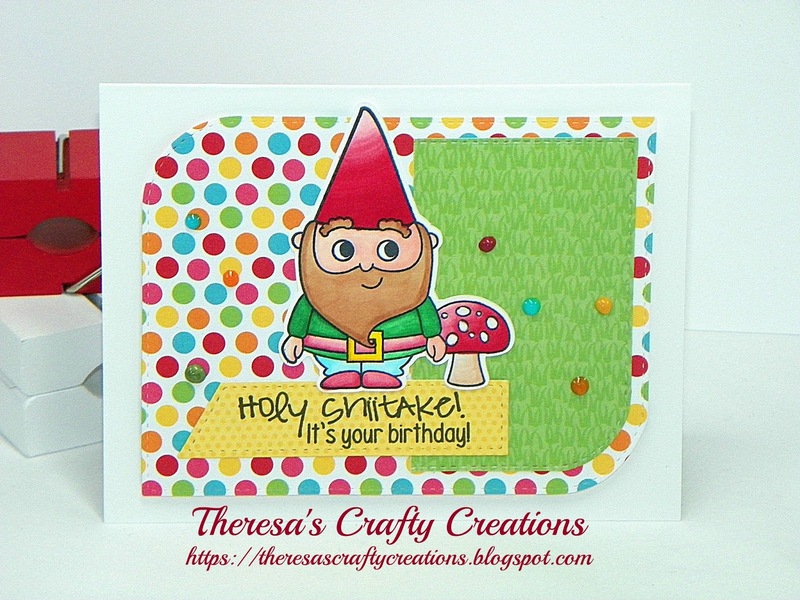 The gnome is so cute and that sentiment is so perfect for your card! SO adorable and that sentiment!! So punny! Love it! Aww this is so cute! Love that little gnome! Hope you are having a fabulous day my friend! So good to talk to you. This card made me laugh! So cute. Cute image and beautifully coloured. Such fun papers, perfect for this card. This card is sooo adorable!! Love it!! Have a great day. I can't stop laughing!! I LOVE this!! TOO cute!